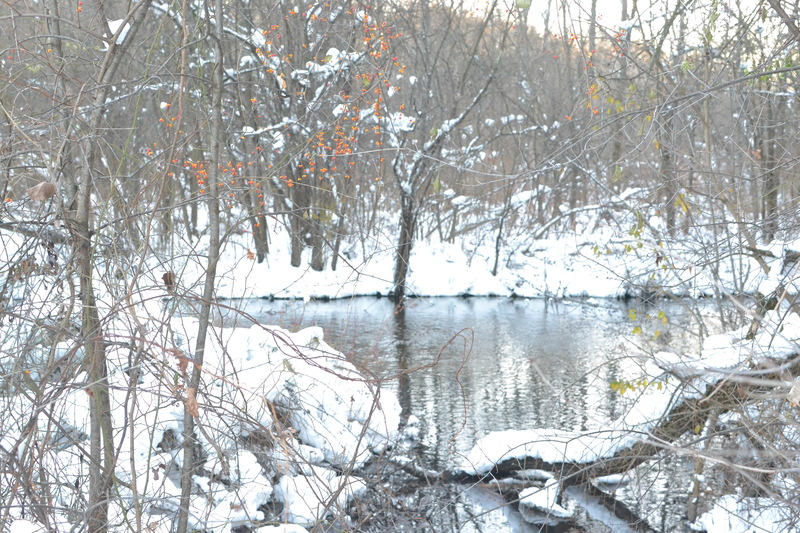 We will have snow for Thanksgiving again this year! Last year was the same way. We traveled up north to my oldest sister Rebekah’s house. As usual, she had even more snow then we did as she lives near the shores of Lake Michigan. Our whole family was having a giant sleepover. Fun times were ahead! The snow glittered off of the trees as we drove. We’d packed all of our winter gear. A massive snowball fight, including teams and forts, was in the plans for the afternoon. Of course it ended up being boys against girls! But I don’t think that the cousins (or my husband!) would have had it any other way! The sun was out, and warmed us as we packed snowballs and created our team hideouts. The boys were ruthless and nailed us with snowballs when they attacked. They of course were rewarded by their devious acts as we girls screamed and ran…..mission accomplished! We did however hit them with our snowballs as we darted away! The boys declared a win that day, but we girls knew better than to ever admit defeat! It was time to warm up and to make a truce, so we headed inside for some pie. 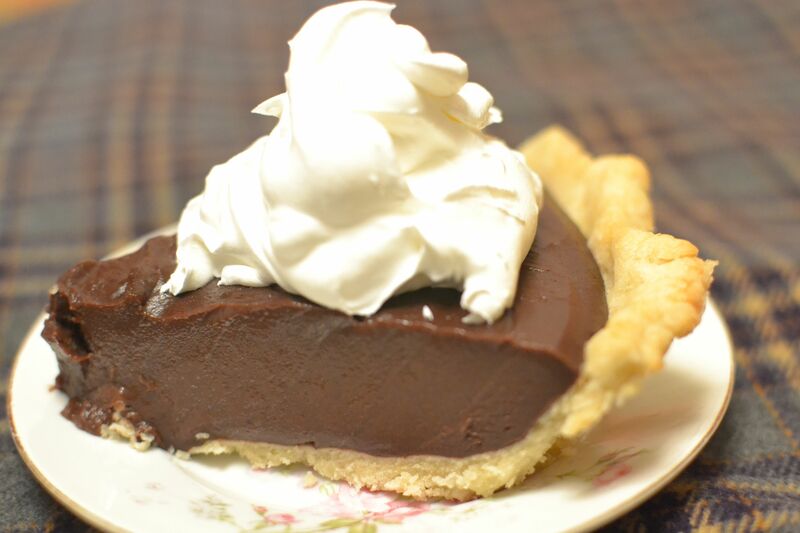 Chocolate Pudding Pie from scratch is my absolute favorite. I had brought that to share. We pulled out all of the pie varieties and started serving up everyone’s favorites. 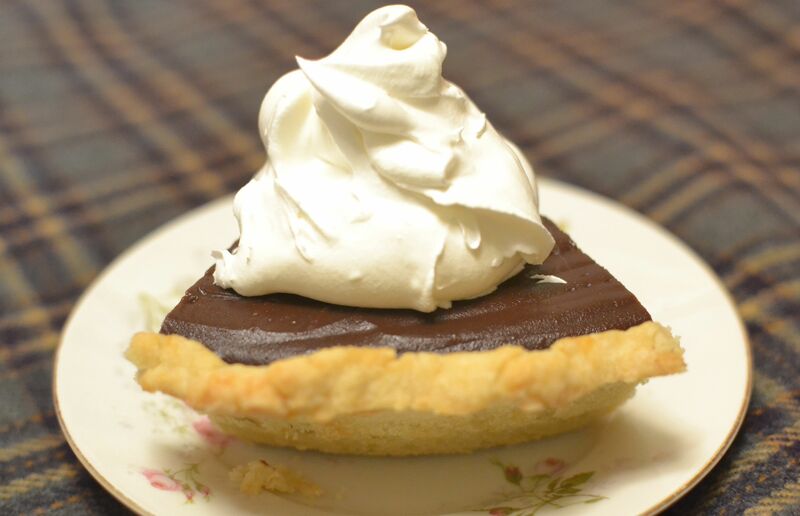 This week I again made my favorite Chocolate Pudding Pie with a delicious and effortless Pat In Crust that I shared in our last post. Stir together sugar, cocoa, corn starch, flour and salt. Blend in milk and eggs. Cook over medium heat until it begins to boil, stirring constantly. Boil and stir for one minute. Remove from heat . Stir in butter and vanilla. Pour into baked pie crust. Press plastic wrap directly onto filling surface. Cool and refrigerate. Place in freezer approximately 2 hours before serving to ensure beautiful slices. Top with Cool Whip if desired. 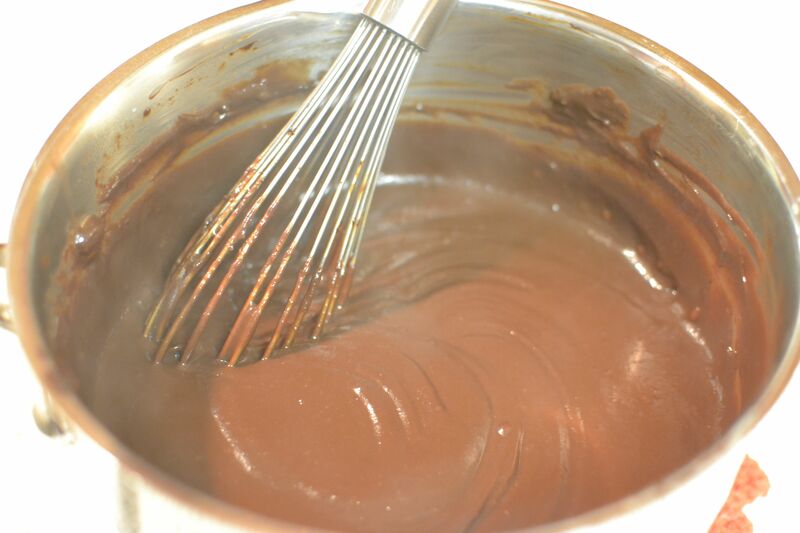 I started by measuring the sugar, cocoa, corn starch, flour and salt right into my saucepan and whisking them together. Then I blended in the milk and eggs. 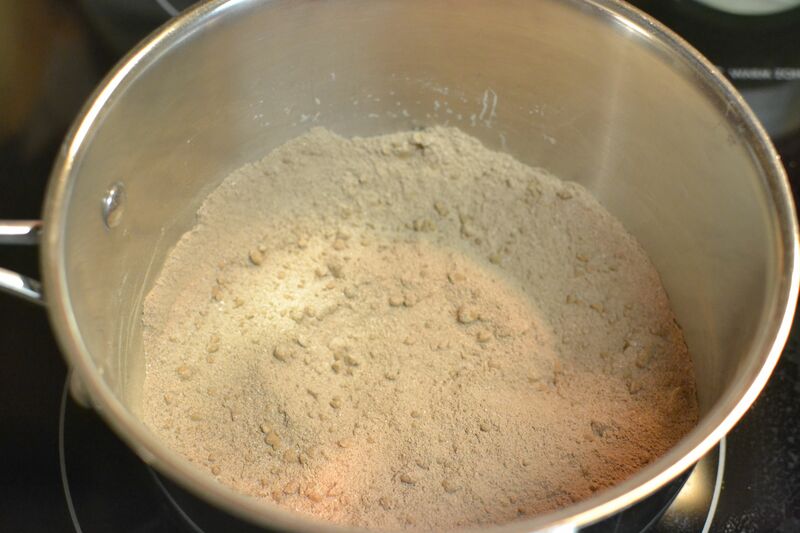 I stirred continually until it began to boil and then timed it for one minute. After it had boiled and thickened, I pulled it off the heat and whisked in the butter and vanilla. 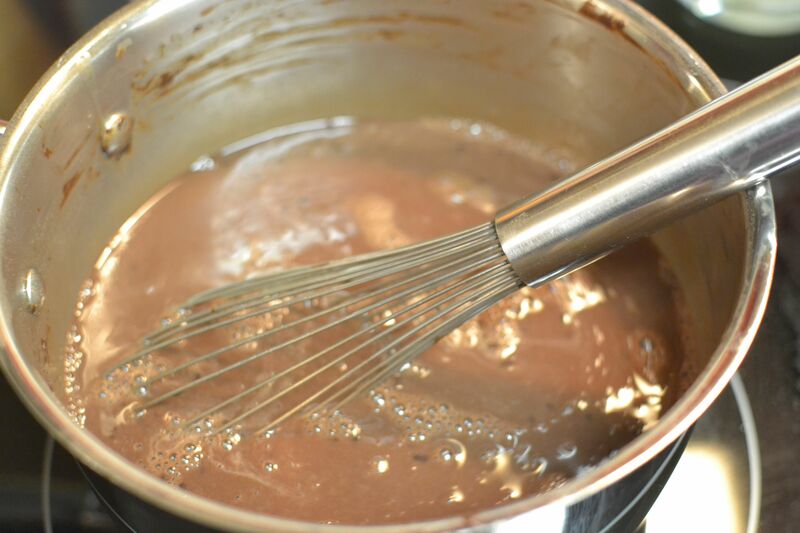 The pudding turned glossy as the butter melted. It was thick and oh so chocolatey! It was also ready to be poured into the pie shell! 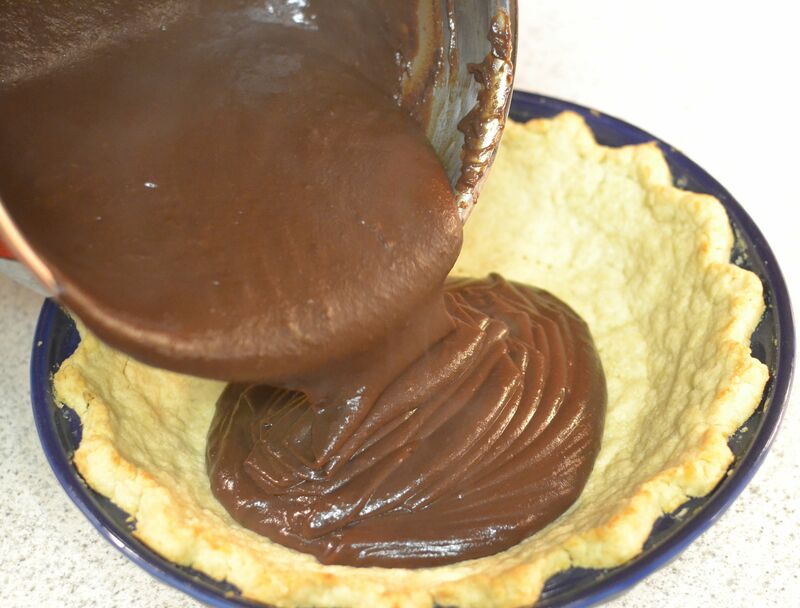 I poured the smooth pudding into the pie shell. I had actually doubled it because I have a deep 9 inch pie plate and always like the filling to go right up to the edge of the crust. 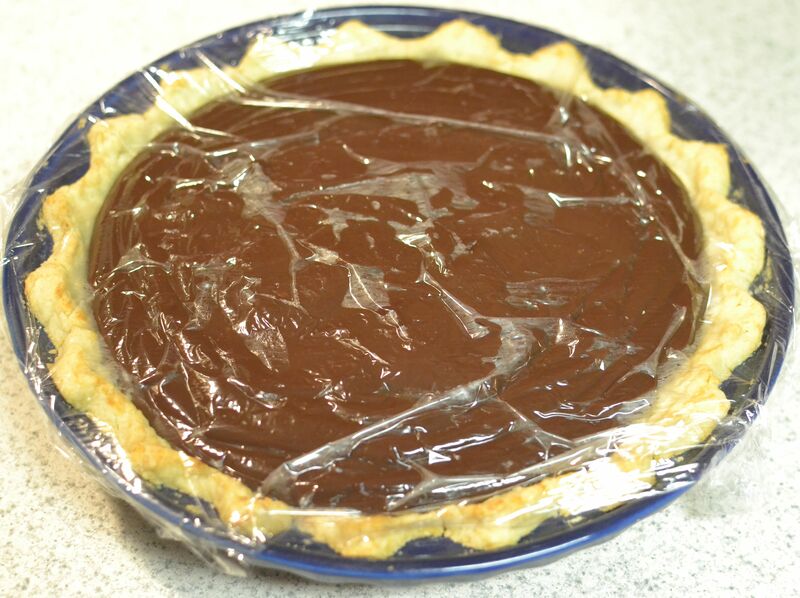 I covered my pie with plastic wrap, letting the plastic touch down and stick onto the pudding. The plastic ensures that the pudding doesn’t form a “skin” layer on the top. Then it went into the refrigerator to set. After it was completely chilled I took it out of the refrigerator and put it in the freezer for about two hours. When I pulled it out, It was nice and firm and it sliced easily. You can also put it into the freezer and let it harden completely, but you’d need to take it out a few hours before you planned to serve it to make sure it was thawed enough to slice. As always, I topped it with a generous amount of Cool Whip! The crust was perfect and crumbly. 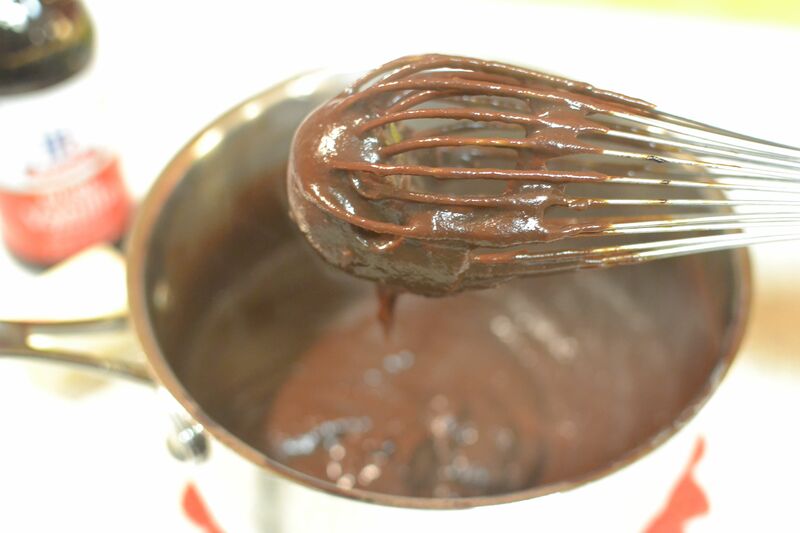 The Chocolate Pudding Pie Filling was thick and rich! It’s so much better than pudding from a box. You really can’t even compare the two. This pie is different than traditional apple or pumpkin that are usually at Thanksgiving dinner. 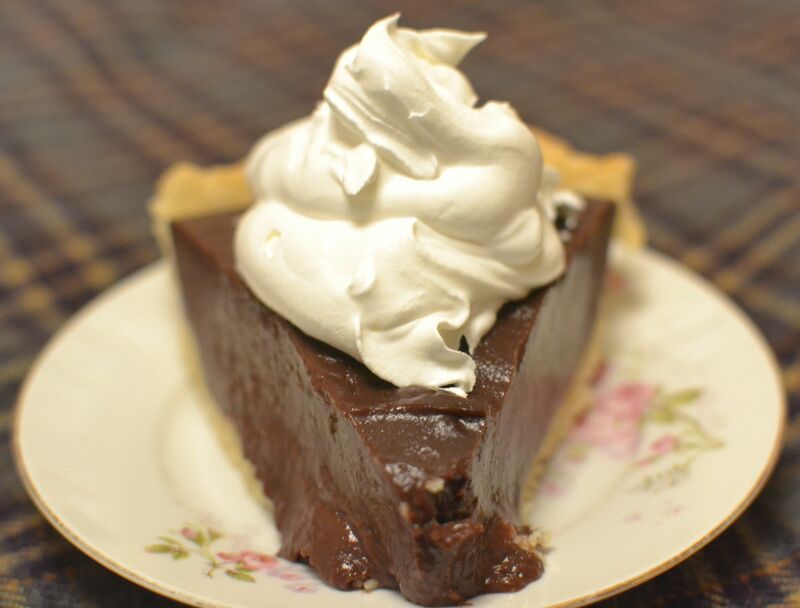 There’s nothing wrong with tradition, but if you want to change things up a bit, try making a Chocolate Pudding Pie to share and enjoy at your Thanksgiving table this year! 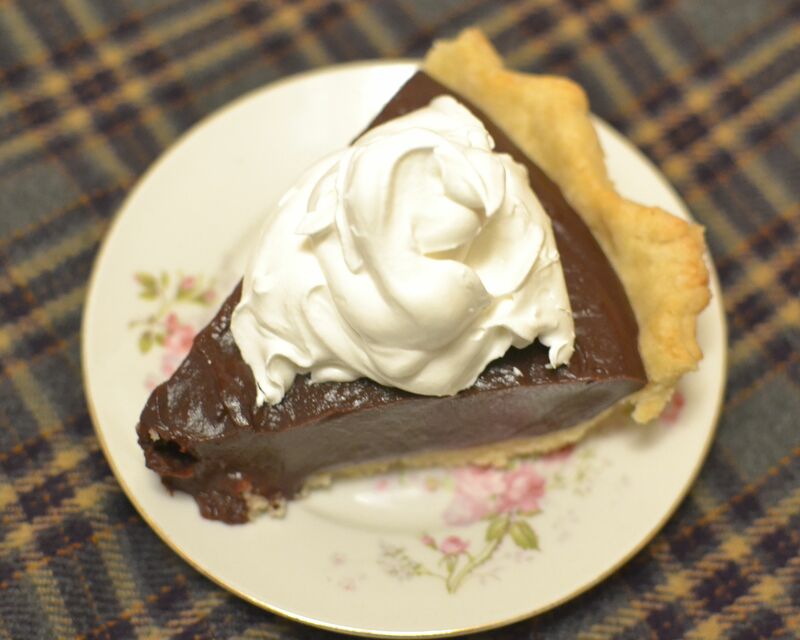 This entry was posted in bonus recipe, Dessert, Pies and tagged Chocolate Pudding Pie Filling, dessert, grandma's cooking, homemade, No bake pie, Pie, scratch cooking by GrandmothersRecipeBox. Bookmark the permalink.